Using genetically modified mouse models to study gene function in health and disease started in the early 1980s. Initially, foreign genes were introduced into the genome by random integration, frequently with variable copy number in tandem, through microinjection of DNA into fertilized eggs. A short time later, understanding DNA repair by homologous recombination allowed Mario Capecchi, Ph.D., and Oliver Smithies, Ph.D., to target specific loci of the genome in cultured mammalian cells. However, targeting efficiency by homologous recombination was too low to be carried out in fertilized eggs. The establishment of embryonic stem cells by British biologist Martin Evans, Ph.D., opened the door to allow targeted mutations to be passed to the progeny, since embryonic stem cells (ESC) are pluripotent and the same homologous recombination mechanism can be applied. In addition, specifically targeted ESCs can be selected and differentiated into germ line cells. Recent breakthroughs in genome editing, especially CRISPR/Cas9 technology, have advanced the field even further by dramatically reshaping the landscape of genetic engineering. CRISPR/Cas9 not only allows more efficient and precise modification of the mouse genome, it has allowed modifications in other species not possible in the past. It is satisfying to see how we have come full circle and returned to using fertilized eggs for generation of targeted mutations, thanks to the high efficiency of CRISPR/Cas9 technology. Yet even with amazing advances in technology, it is still expensive to generate and maintain a transgenic colony. It often happens the intended mutation is fully characterized in the founder line when the model is generated, but the mutation is no longer present, or not the same several generations later. Unless you are using a reliable genotyping assay and strictly adhering to routine genetic quality control steps, it is easy to miss these changes. Below are a few practical tips to safeguard the genetic integrity of your colony. When an animal model carrying the mutation of interest is created, vigorous genetic characterization has to take place to ensure the intended mutation is introduced. Many times initial genetic testing methods, such as long-range polymerase chain reaction (PCR) or Southern blot analysis for screening targeting events in ESCs, may not be suitable for routine genotyping. Therefore, it is necessary to design a simple and reliable assay for this purpose. An allele-specific assay targeting specific mutations is always preferred to a generic assay targeting common elements, such as a selection cassette, because it would allow early detection of genetic contamination and accurate genotyping for complex projects when multiple mutations are involved. Random integration of a foreign gene, such as human bacterial artificial chromosomes, is still a very useful tool, and many popular disease models are created using this approach. 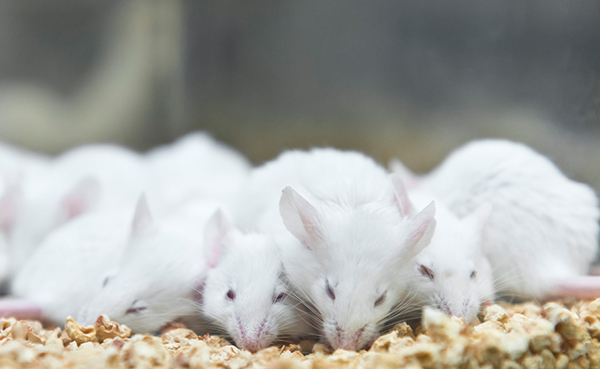 Unfortunately, many laboratories still use standard PCR for genotyping—even for initial characterization of the founder line—while treating all positive mice the same. The consequences of this approach are dire. A transgene could be inserted at adjacent sites and only segregate occasionally. Multiple copies could change over time by various and often poorly understood mechanisms, including uneven crossover when a transgene is maintained as homozygous status. If not detected early, the outcome is grim as this change will directly affect transgene expression and result in large variations of phenotype as well as disease onset. So rather than regular PCR, consider the more sensitive quantitative PCR to identify transgene instability and segregation issues. By comparing the relative transgene copy number between the breeder and its progeny, you will gain valuable information to help guide genetic quality control and colony management. One of the challenges of CRISPR genome editing is that it is so efficient it often introduces additional mutations. This makes it difficult and expensive to fully characterize. Additional INDELs or substitutions adjacent to the intended mutation, or even a duplication event, can occur and evade initial identification by laboratories that generated the mutation. At Charles River Laboratories we use a simple method based on heteroduplex formation, which often provides the first clue to the existence of additional mutations. Further testing, such as sequencing and qPCR, can follow to ensure only the intended mutation is maintained in the colony. Many tissue-specific Cre lines, even inducible, are not as specific as they claim to be. When crossed with a conditional knockout line, it is crucial to have a comprehensive genotyping assay to allow early detection of a Cre-mediated recombination event in the germline. This can save valuable time and resources. An alternative breeding scheme might be available if your favorite tissue-specific Cre line causes germline deletion at a high frequency. Trinucleotide repeat expansion, mostly in the coding region, can lead to severe disorders such as Huntington’s disease and Spinocerebellar ataxia. This is sometimes called dynamic mutation since the repeat size is unstable, and it could expand or shrink both in somatic cells and in the germline. It is important to vigorously monitor repeat size when selecting animals as breeders and as experimental cohorts to ensure reproducibility of the phenotype. Don P. Liu, M.D., Ph.D., is principle research scientist of genetic testing services at Charles River Laboratories (CRL).